Chemistry Professor Emeritus Ernie Simpson has been honored as a fellow of the American Chemical Society for demonstrating outstanding achievements and contributions to science, the profession and ACS. 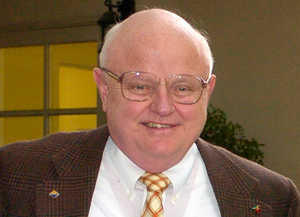 During his 40 years at Cal Poly Pomona, Simpson directed the cooperative education/internship program, developed the industrial chemistry option and earned a number of awards from the College of Science and the university. His research interests and publications are in the areas of polycyclic aromatic hydrocarbons, carbon-13-labeled compounds, and phenolic compounds, especially in grapes and wine. After Simpson retired from full-time service in 2001, he continued to teach part time through 2008. Simpson, who joined ACS in 1966, is a councilor and a past chair of the San Gorgonio section and has served on the Local Section Activities Committee for the national organization. A frequent ACS tour speaker, he has presented on the chemistry of wine in 46 states. The wine talk covers the gamut of wine appreciation, from the natural chemicals in wine to the health benefits of moderate wine consumption. The group of 96 fellows for 2012 was recognized at an induction ceremony during the society’s 244th National Meeting & Exposition in Philadelphia in August. ACS is the world’s largest scientific society, which includes 160,000 members, and serves as a global leader in providing access to chemistry-related research. For more information about the ACS Fellows program, visit www.acs.org/fellows.